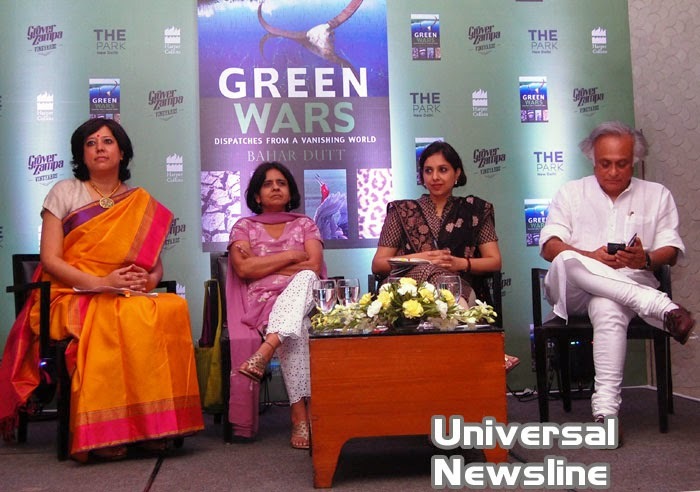 June, 2014, Delhi: Grover Zampa Vineyards along with Harper Collins and The Park Hotel hosted an intellectual book launch evening on the World Environment day discussing the most pressing issue of our time with the author herself BAHAR DUTT, who is a leading television journalist and environmental editor along with the elite speaker Jairam Ramesh, SunitaNarain moderated by SuhasiniHaider. The evening which took place at The Park Hotel in Delhi, was well accepted by the guests who enjoyed intellectual conversations with glass of award winning Grover Zampa wines. The event was graced by some eminent personalities like Jairam Ramesh Ex - Minister Rural Development; Barkha Dutt Editor NDTV; Padma Shri Sunita Narain Director General of the Centre for Science and Environment; Amitabha Bagchi author of the bestseller Above Average; Suhasini Haider Diplomatic Editor The Hindu; Amrita Tripathi Anchor CNN-IBN; Geetanjali Iyer legendary Doordarshan Anchor; Vijay Bedi renowned wildlife filmmaker; Rajesh Bedi one of the biggest names in wildlife photography and eminent British journalist John Elliot, who enjoyed great discussions with sumptuous food and ecstatic wine! Talking on this occasion, Mr. Malay Kumar Rout, Business Head, Grover Zampa Vineyards expressed, “Grover Zampa Vineyard is extremely happy to celebrate this special occasion with Harper Collins and the esteemed guests, experiencing our award winning wines. In today’s times, this beverage has gained immense acceptance by the Indian palate”. With the two distinguished brands coming together, Grover Zampa vineyards offer a selection of the finest wines in the country which has opened its offerings in Delhi. The consumer can get a taste of a varied range of high quality wines like Grover Zampa Brut Rose, La Reserve, Sauvignon Blanc, Chenin Blanc, Merlot to name a few. It was a complete experience for wine lovers from the city and its catchment areas who enjoyed great conversations at The Park Hotel along with some marvelous wine and splendid food. impressive pedigree in the Indian wine industry today. It owns brands that are widely recognized brands in the Indian wine market and is backed by respected veterans of branding, marketing and distribution in the alcobev industry. Currently the #2 wine company in the country, Grover Zampa Vineyards is poised to emerge as a strong contender to the market leader.